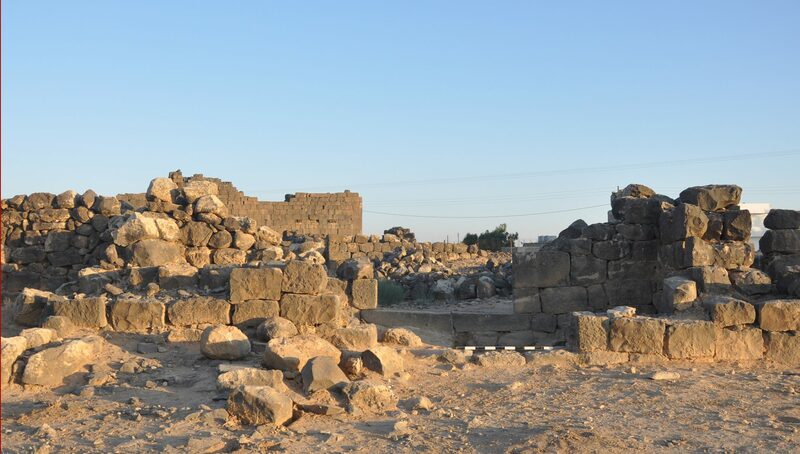 The preservation of Umm el-Jimal’s Commodus Gate and West Entry Area was completed through a permit-based partnership with the Department of Antiquities of Jordan. The work was funded by USAID as a component of the ACOR-managed Sustainable Cultural Heritage Through Engagement of Local Communities Project (SCHEP). 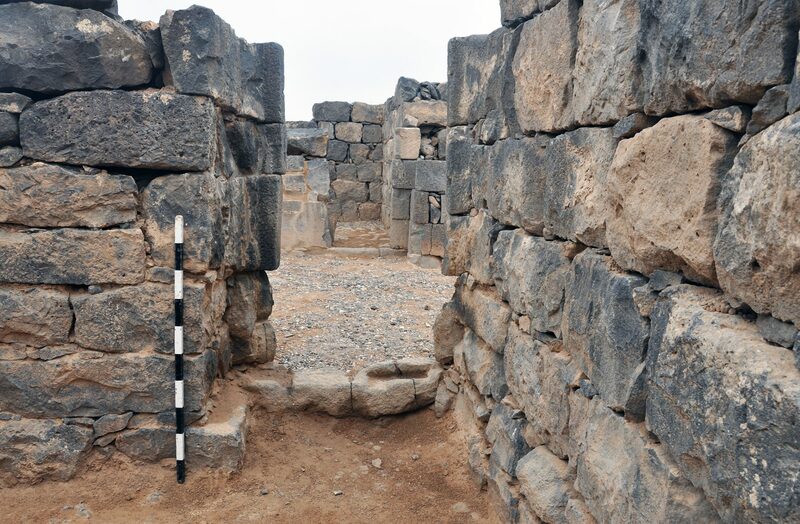 Choice of this location was determined by its function as an entry linking the Umm el-Jimal community’s commercial and civic center to the archaeological site. The Interpretive Trail, which is also being developed under SCHEP, will link this entry to the Interpretive and Hospitality Center being created at the southeast entry to the site. A major aspect of this field work was training. 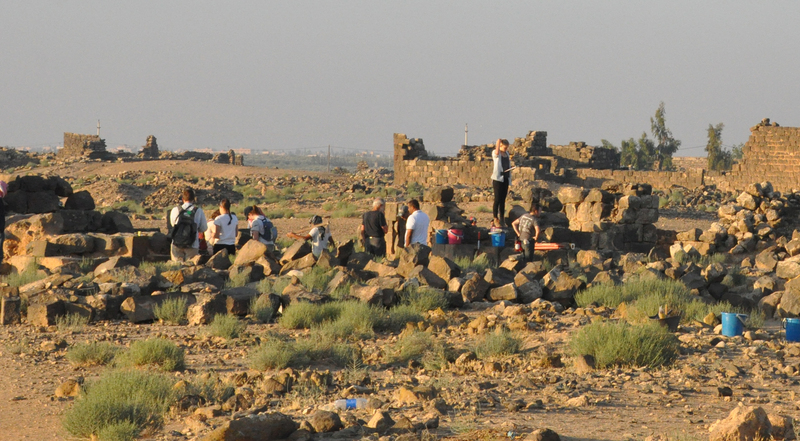 The preliminary excavations and site preparation were conducted in June 2015 as a Calvin College field school for archaeological methods and as a site management training course for all foreign and local staff members. The preservation season conducted in October-November 2015 continued site management training with emphasis on correct building preservation theory and practice. The Calvin students received course credit and the local Jordanian staff members were issued Site Manager Certificates by SCHEP. The project was completed by the Calvin College Umm el-Jimal Project in partnership with Open Hand Studios. The West Entry Area and Commodus Gate Preservation Season, conducted from 1 October to 8 November 2015, was set up with a preliminary excavation and documentation season held 28 May to 20 June, 2015. (See the blog entry “SCHEP Project Launch & UJ15 Slideshow” from June 20, 2015.) 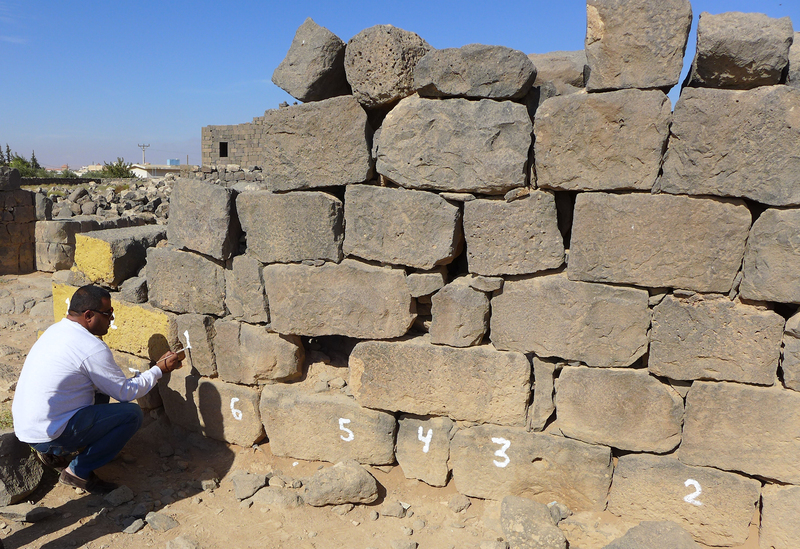 A report on the excavation season is being submitted to the Annual of the Department of Antiquities of Jordan. In that season it was determined that the gate is indeed second-century Roman as the dedicatory inscription from the co-regency of Marcus Aurelius and Lucius Commodus (AD 176-180) had ‘predicted.’ The South Tower of the gate had been extensively remodeled as part of the West Church Complex, when a new entry gate into the church yard was built through the adjoining Roman perimeter wall on the south side of this tower. The North Tower had a very fine Late Antique cobble floor laid over the original Roman stone chip floor. 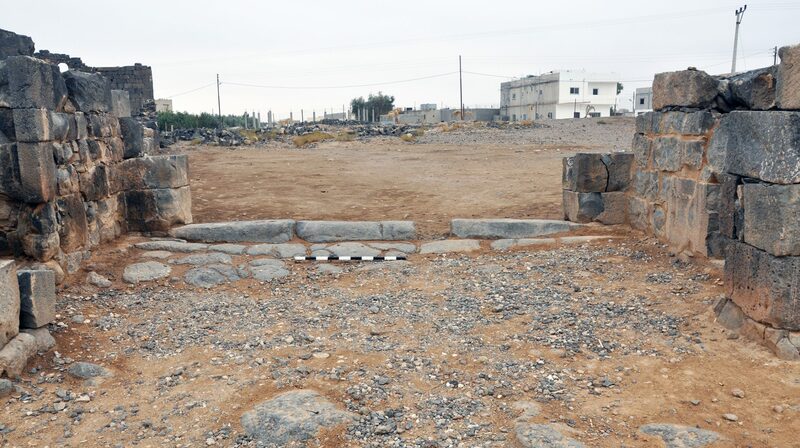 It was also discovered that the Roman roadway leading from the gate north west towards Qasr al-Ba’ij and the Via Nova Traiana had been repaved in both the Late Roman and Byzantine/Umayyad periods. The gate and west entry area were mapped and photographed and its collapse masonry was organized and documented in preparation for the preservation and landscaping of the area. 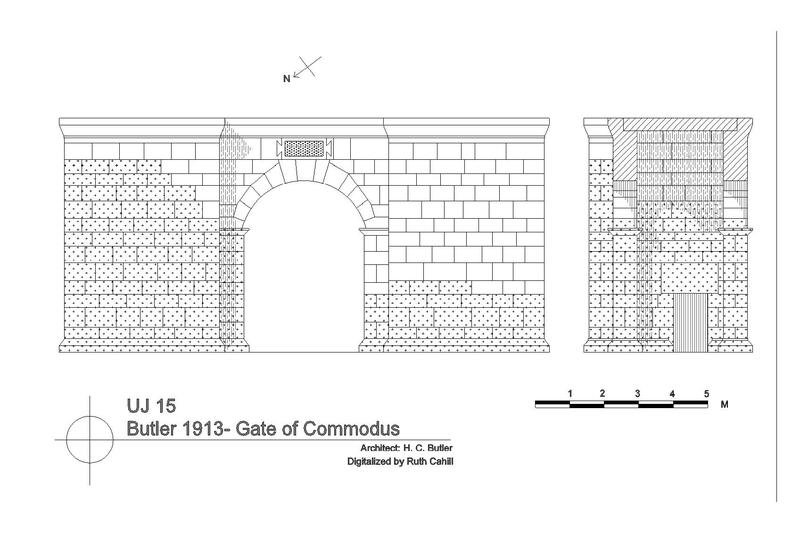 Preservation of the Commodus Gate using the available masonry in keeping with international standards of the conservation of historic buildings. Because most key architectural elements are missing, this work could not include the restoration of the superstructure. 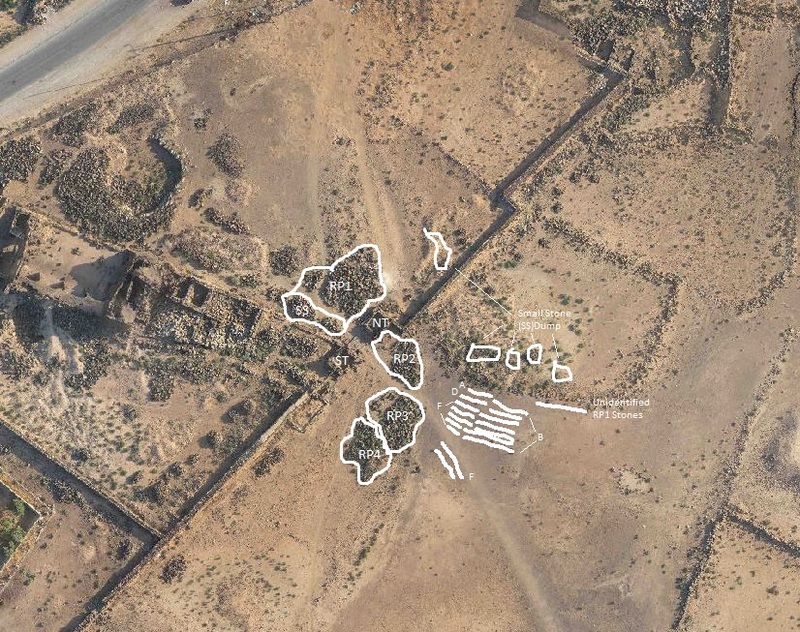 The landscaping of the terrain inside and outside the Commodus Gate in order to turn the West Gate Area into an attractive link between the Umm el-Jimal community and the ancient site. On the town side the area links to the Maydan, while in the antiquities site it opens up onto the interpretive trail. The engagement of members of the community in the work described in goals 1 and 2 as part of their site management training. 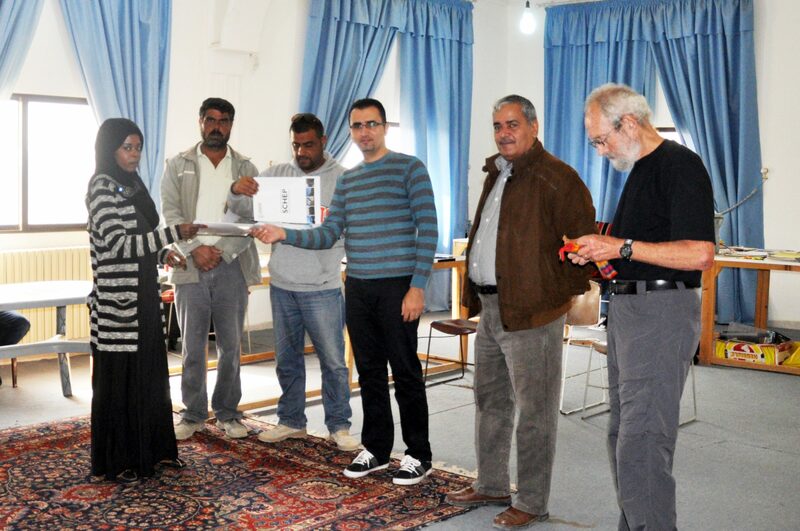 This training followed the Umm el-Jimal Project field school’s inductive method – learning by doing – with a participatory decision making process characterized as consultative (rather than authoritarian). The team was organized as follows. Consultative Oversight Team: Bert de Vries (Project Director), Muaffaq Hazza (Field Director and Site Steward), Na’il Tuhamer and Ali Owaisi (DoA Representatives), and Ali Aqil (General Foreman). 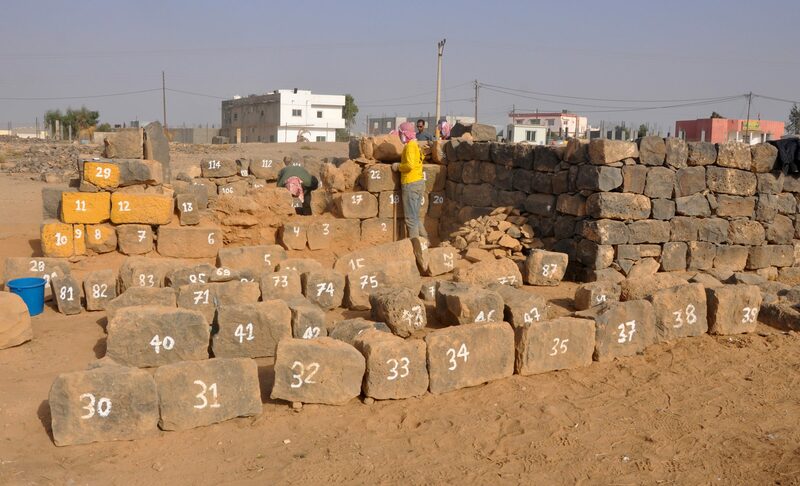 The following figures show the condition of the site and gate at the outset of the work. 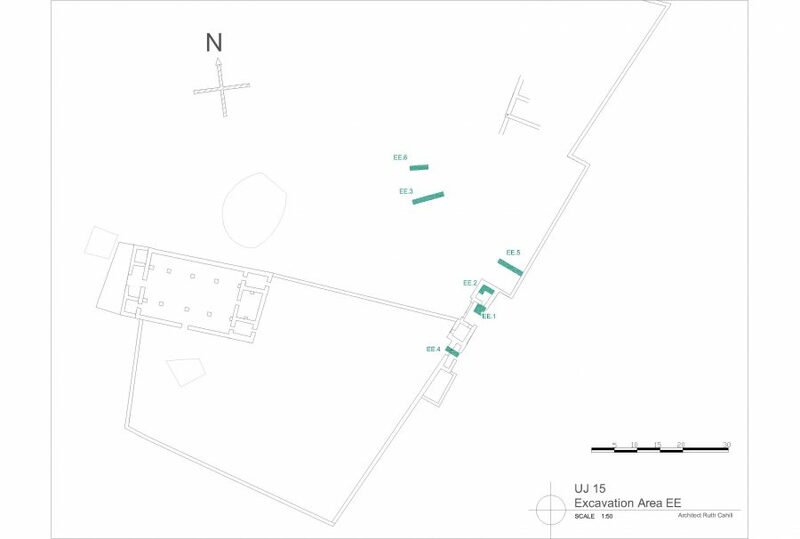 In summary, the area around the Commodus Gate was strewn with randomly placed collapse debris from an earlier DoA clearing of the Commodus Gate and the West Church. 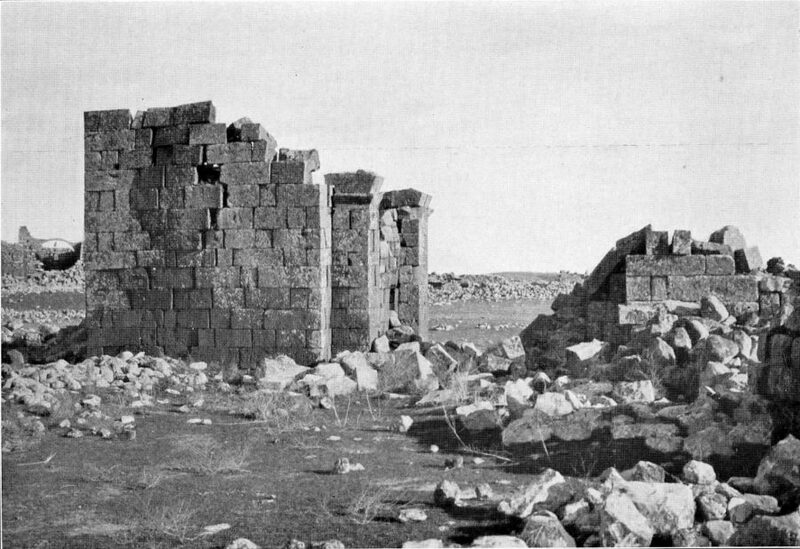 H. C. Butler’s Princeton Expedition survey of 1905 and 1909 gave us a very different picture of the Commodus Gate. 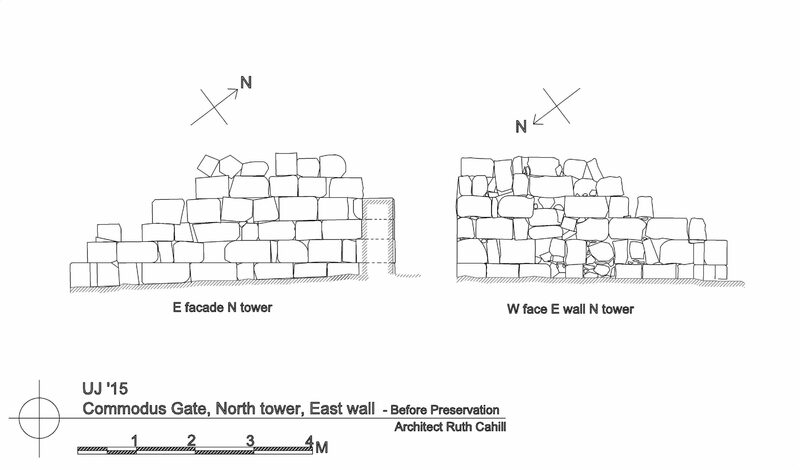 As the following drawing and photograph (Figures 6 and 7) show, the north tower especially was extensively preserved, and much of the components of the two arches supporting the Gate Chamber roof, and the dedicatory inscription were lying in the collapse debris cluttering the floor of the gate. These documents have been most helpful in planning and executing our work. Since Butler’s documentation there was further collapse. One can see the fragile condition of the west face of the north tower in 1905. Presumably this collapsed soon after in an earthquake (possibly 1926), so that the actual standing remains of this façade would be represented by our own photograph of the cleaned site (see Figure 11, below). However, very little of the fine masonry visible in this photo—the finely dressed west façade stones, the voussoirs of the arches and the dedicatory inscription block—remains at the site in 2015. What happened? The following story is hearsay, but makes sense. 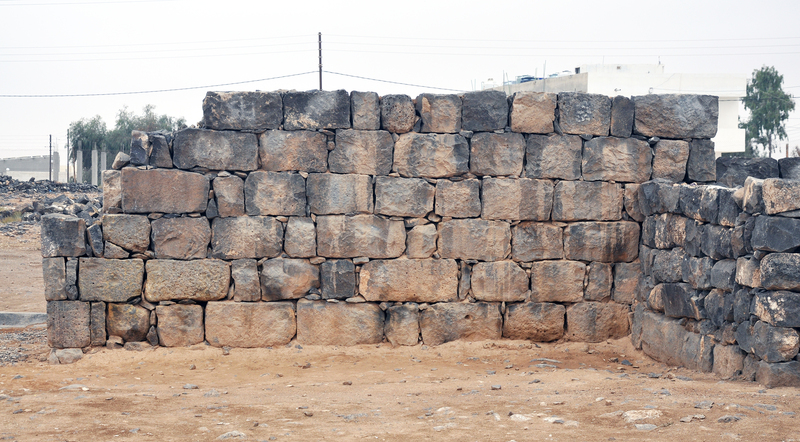 A local informer told us this year that when he visited the village of Umm ar-Rumman—about 20 kilometers away in south Syria—in better times, he was impressed by the excellent basalt masonry of this village’s main-street structures. When he asked a local resident to explain, he received this answer: Over a three-year period during 1940 to 1943 the people of Umm Ar-Rumman transported much of the masonry from the Commodus Gate and the north side of the West Church to Umm ar-Rumman on the back of camels arranged in two caravans, twenty coming south empty, and twenty going north loaded. In essence, the story punctuates the fact that the stones are missing and not available for what could otherwise have turned our preservation project into a partial restoration following Butler’s documentation in 1905-9. We will have to wait for better times for visits to Umm ar-Rumman and Suweideh in Syria to at least verify the fates of the missing stones and inscription. Cleanup and documentation of the surviving wall sections with drawings and photographs, work that was essentially completed in May-June 2015. Number the stones of the wall. 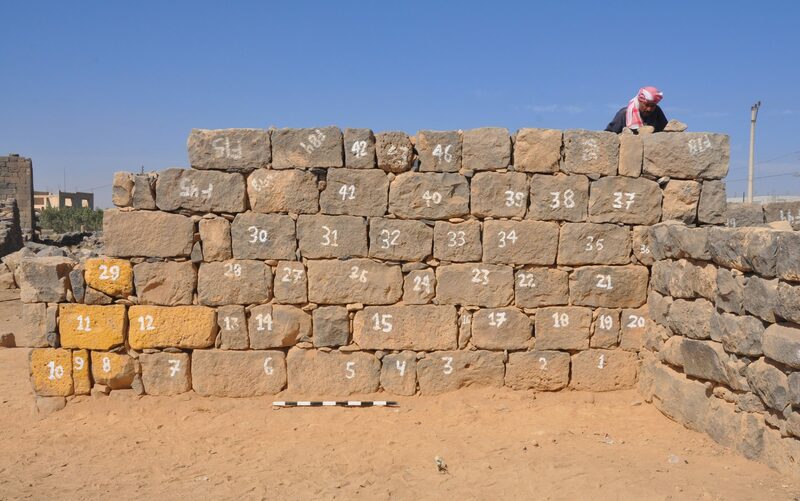 Photograph, draw and reproduce the numbered wall photos for use by the mason teams in the field. Dismantle the slumping portion of the wall. 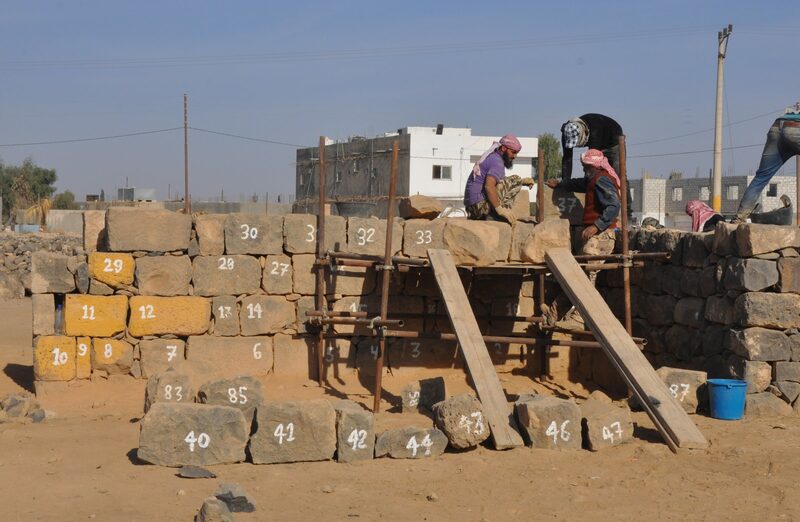 Both faces of any wall were done together, and the open spaces in the wall cores were filled with a mixture of stone chips and soil to create a solid and stable platform for installation of the course above. Because strategically spaced headers tie the two faces of the wall together, the dry-laid construction of the original could be replicated without the use of cement or mortar. 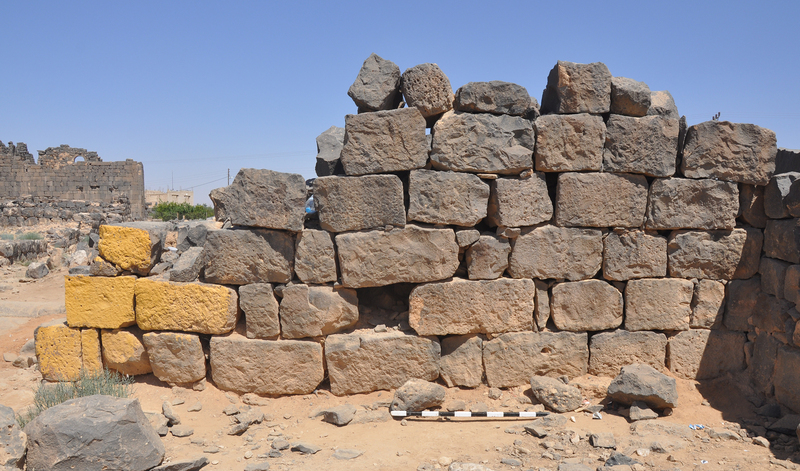 Only similar stones from the Gate’s own collapse debris were used for infilling missing components of the wall. Note that for the back walls the precise original location of the more roughly finished stones cannot be determined precisely. See un-numbered stones in Figure 15. 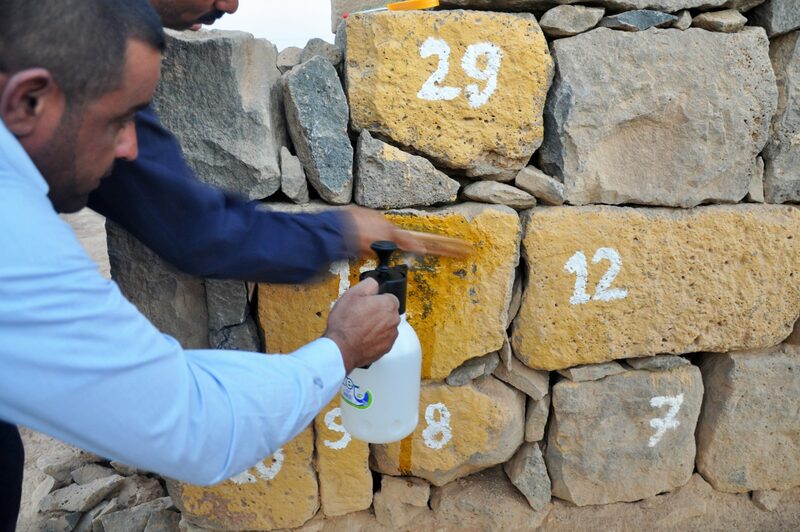 Once completed, the white numbers (and yellow paint applied by vandals) were scrubbed off using paint thinner in spray bottles. The north tower’s east wall is an excellent example of the conservation process for the Commodus Gate. All other walls of both towers received similar anastylosis. A major change to 2nd-Century Roman construction was the insertion of an elaborate 6th-Century entryway into the Roman wall immediately to the south of the South Gate tower. This new entry included the remodeling of the South Tower, and gave access to the West Church courtyard from inside the Byzantine settlement. We preserved this new gateway as a component of the entire structure, which was therefore conserved to present its Late Antique, rather than Roman, phase of use. 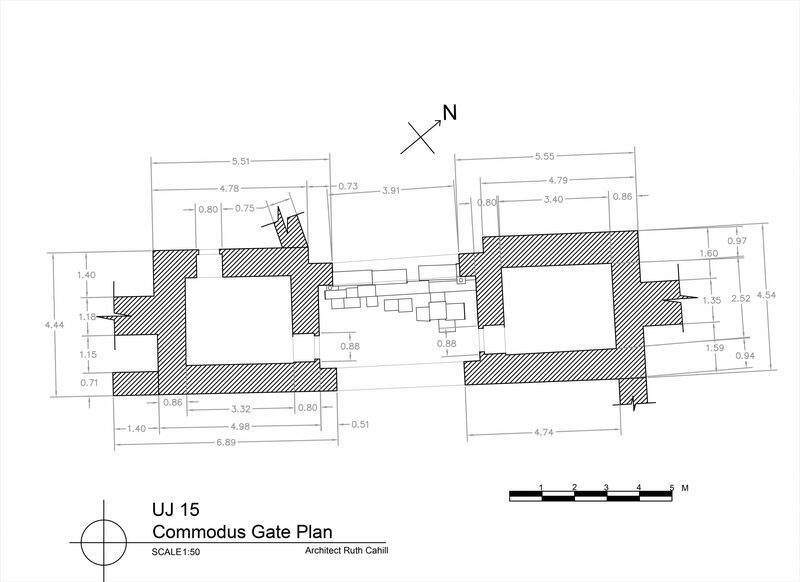 The work on the Commodus Gate and the West Entry Area was completed on schedule on 5 November 2015. All the goals for this project as stipulated in the Introduction were met beyond expectations. The Commodus Gate was conserved and the West Entry Area cleaned up to enable clear vistas of the gate and the ancient town from the community. The success of this work rests squarely on the shoulders of the 24 local team members who surpassed their role of trainees to perform as experts. Figure 29 shows the group framed by the preserved Commodus Gate ‘skyline.’ This picture symbolizes the grand success of the community engagement goals of this project. On Sunday, 8 November 2015, the trainees who participated in the May-June and October-November UJP-SCHEP training program were formally certified as having fulfilled the requirements of the Archaeological Site Management component of this project. This means they not only know how to do the physical work of site management ranging from archaeological excavation to structural preservation and landscape maintenance, but they also understand the meaning and purpose of archaeology and know the principles and rules of proper conservation. As director and instructor, I am truly proud of them and plan to see them develop into an expert work force in this field. In fact, this certification has enabled their being hired as conservation specialists for the preservation of the Umm el-Jimal Cathedral, a project funded and managed by the Department of Antiquities in the summer and fall of 2016.